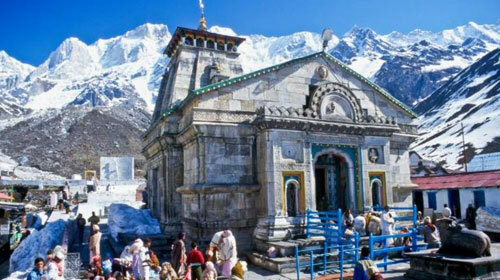 Thekedarnath temple dedicated to Lord Shiva is located in the Himalayan ranges near the Mandakini river at Kedarnath. The temple is pen only between April to November due to extreme weather conditions. Lord Shiva is worshipped as Kedarnath. The presiding deity is in the form of a Linga. Adi Sankara is believed to have attained Mahasamadhi at this place and his Samadhi lies behind the temple. After the Kurukshetra War, the five Pandava brothers were advised to seek the forgiveness of Lord Shiva at Kedarnath for killing their own kin.As they approached Kedarnath, Lord Shiva who did not want to forgive them turned into a bull and hid along with the cattle in the hill. But the brothers found him out and Shiva decided go under the ground, but one of the brothers held him by the tail and forced him to appear before them to give them forgiveness. Thus, after Shiva forgave them, the brothers built the first temple at Kedarnath. The temple is closed from 3.oo pm to 5.00 pm. Before 3.00 pm devotees can touch the idol and perform ghee puja. The most grandly celebrated festival here is the Badri Kedar festival which spans eight days in a year. Other festivals include the Sharavani Annakoot Mela and the Samadhi puja.